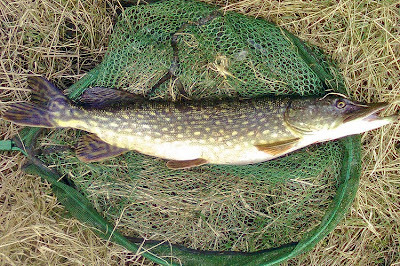 Andrew Kennedy's Angling Blog at Just-Fish.co.uk - Fishing Blog Coarse Fly Lure Pike Perch: The final two sessions of the 2009/10 season! Firstly, I have to say it was great to just get a few days out on the bank at last! For me, 4 full days fishing out of 14 is quite rare (if only it wasn't! ), and I managed to actually relax into the fishing; not so-much-so that I wasn't thinking about what I could do to improve my chances (which, incidentally, I mainly concluded was very little! ), but enough to actually enjoy just being there. In reflection, I'm quite disappointed in the decisions I made on the first day. I arrived at the peg which I knew had personal record-breaking potential, to find the water a bit on the shallow and clear side. The main feature was a near-bank bush in a small eddy and my first impression was that it was too shallow for much to be sheltering beneath it, with at least 6 inches less water in the river than the previous year. Still, I'd done a fair bit of roving the previous two years and it didn't result in any big perch, so I decided to keep a low-profile, keep feeding the swim and sit it out, hoping a perch would at least visit the bush at some point during the day. When one did, I would be ready! I didn't cast a line for the best part of an hour, instead deciding to feed small amounts of chopped worm, groundbait and molehill soil and a spray of maggots on a regular basis. My visions of the gathering shoals of hungry bait fish flanked by even hungrier perch were maybe a tad optmistic, as when I eventually made my first cast the plump lobworm generated no attention. I fished on, undeterred, and explored the rest of my swim by alternating with a float and a second, scaled-down feeder rod baited with maggots. Still I got no bites and I eventually decided to feed the swim up and rest it for a while. I had a lure rod with me and I couldn't resist a wander. With my bait rods out of the water I took off with a few lures and tried some swims which have been productive for me in warmer weather. At least if I could get a take from a perch somewhere it would let me know they were feeding, and also help me figure out where they were holed up. Despite my best efforts fishing various lures in all manner of swims I couldn't find a perch keen enough to even follow a lure. Before long I reached the upstream limit of the stretch, and a very under-fished peg with loads of natural features. Casting from a high bank above an eddie, I watched my lure for the whole retrieve and just as I lifted it from the water, a pike launched itself from the shadow of a bush and didn't just swipe at the lure, it breached the water completely and took a snap at it mid-air! Of course it missed, but provided me with quite a spectacle. I chanced another cast, clinging to the slim hope that the fish would have another go and watched as it really aggressively pounced, paused and inhaled the lure! What beautiful condition this fish was in; completely un-marked. The condition and location this fish came from leads me to believe it was previously uncaught and I'm pretty sure in future it will treat curly-tailed lures with just a bit more cynicism! I had to revel in this capture slightly more than I would have liked, because the perch never switched on and it ended up being the only fish I landed all day! As soon as I'd packed up, I jumped in the van and headed towards Reading, to stay in a hotel close to the Kennet so that I could meet up with Will bright and early next morning.